Pierre-Auguste Renoir helped to launch an artistic movement called Impressionism in 1870s. The couples dancing prints are my favorite as the identity of who the couples are is still a mystery. West facing windows make your room light and airy with it’s 8’ ceilings and original maple floors. 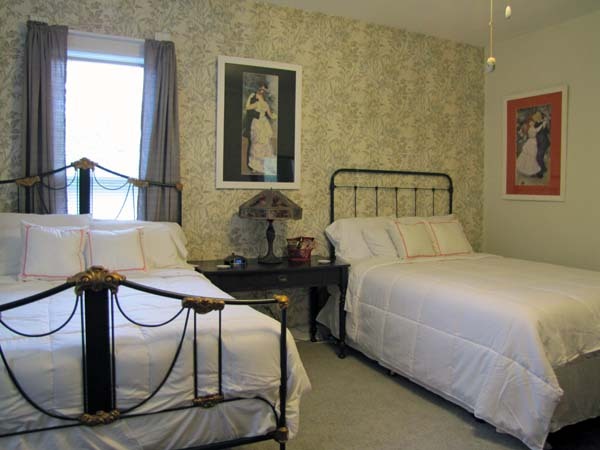 This room features a queen and full bed, sitting area with internet TV, and dresser. A private locked bath is just down the hall with a claw foot tub and plenty of space for your items. Bath robes are provided for your comfort. This room sleeps up to 4 people. Vintage and antique furniture, clock, ceiling fan, hot water dispenser and mini frig are provided. The room also has extra blankets, pillows, hairdryer, toiletries and plenty of room to relax. Enjoy your favorite show on a flat screen internet TV after your day of shopping or hiking. Upstairs common area has an ice filled freezer, comfy reading chair, and table for snacking. Downstairs there is a large Common area with game tables, frig, microwave, record player and TV. During the warm months you can enjoy a drink on the spacious porch with its rocking chairs and view of an authentic Brown County log cabin. Entry to home and rooms is convenient with keypads that will be programmed to your personal phone number. Parking is plentiful around the home with designated spaces at the back of the home. Although there is no policy that prohibits children, if they are part of your party they must be accompanied by an adult at all times, stairway is open with wood steps, and vintage and antique items that you will be responsible for if broken or damaged.